South Korea's presidential office has issued a cautious stance in relation to U.S. President Donald Trump’s call for Seoul to increase its share of the cost for stationing American troops on the Korean Peninsula. Presidential spokesman Kim Eui-kyeom on Wednesday responded to Trump's latest remarks which came only two days after the allies signed an agreement that will raise South Korea's contribution this year for maintaining the 28-thousand-500 U.S. troops by eight-point-two percent to about one-point-04 trillion won. Kim noted the contract is valid for one year, but can be extended if both sides agree. He cautioned that an additional price hike for South Korea should not be taken as an established fact. During a Cabinet meeting on Tuesday, Trump stated that South Korea agreed to pay 500 million dollars more for defense costs, adding that the financial burden on the South Koreans must rise over time. 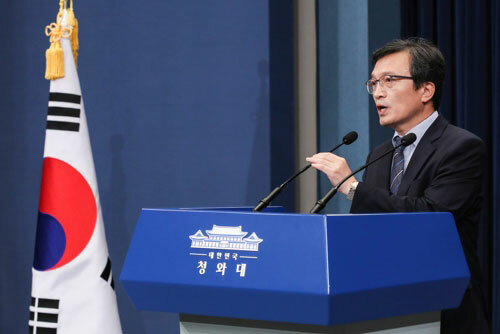 Meanwhile, Foreign Minister Kang Kyung-wha told reporters Wednesday that it would be necessary to determine the context behind Trump's comments, but that the two sides' agreement is clear.